The Palestinian Authority is filing a UN resolution demanding a full Israeli pull-out from the occupied territories within two years. Meanwhile, the US is unsure what it wants to see from the resolution. Officials in Ramallah warned they would press ahead with Wednesday’s Security Council bid in spite of American opposition, just as US Secretary of State John Kerry was still trying to find common ground between the Palestinians and Israelis this week. "We will submit our project to the UN Security Council tomorrow [Wednesday]," Palestinian leader Mahmoud Abbas told journalists late on Tuesday. The motion, among other things, will push for Israeli withdrawal beyond the pre-1967 borders, with East Jerusalem becoming its capital, and advance the process of a two-state solution. It will be submitted by Jordan, as Palestine is still an observer at the Security Council. Only the 15 members can file motions. But Washington is still likely to veto the Wednesday resolution in New York, despite the risk of greater alienation from a Europe that is increasingly vocal on the issue of Israeli aggression against Palestine. The US has supported Israel with its veto power dozens of times throughout the last seven decades. "This isn't the time to detail private conversations or speculate on a UN Security Council resolution that hasn't even been tabled, no matter what pronouncements are made publicly about it,” he added. Israeli Prime Minister Benjamin Netanyahu continued to be adamantly against the motion throughout the week, warning that “terrorists” would run wild if Palestine were free. "Attempts of the Palestinians and of several European countries to force conditions on Israel will only lead to a deterioration in the regional situation and will endanger Israel," he warned in a statement. 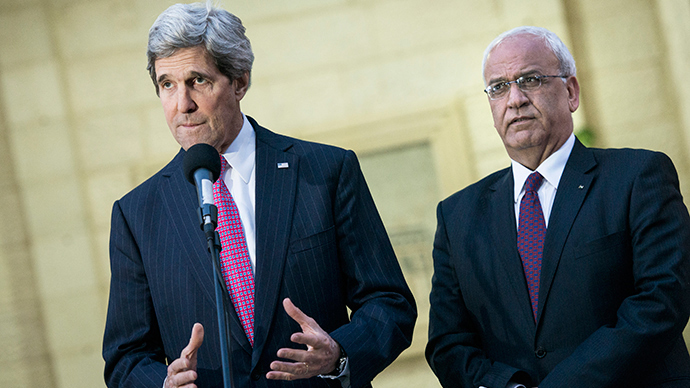 Kerry, despite admitting that a two-state solution is important, warned that nothing can be allowed to derail March’s snap elections in Israel. He said they were mindful they had to "carefully calibrate" any steps that were taken and it was "imperative to lower the temperature" in the region to find a path for peace wanted by both Israelis and Palestinians. "The status quo is unsustainable for both parties," he said. "Right now what we are trying to do is have a constructive conversation with everybody to find the best way to go forward." The European Parliament adopted the resolution recognizing Palestinian statehood in principle. A total of 498 MEPs voted in favor, while 88 were against. [The European Parliament] supports in principle recognition of Palestinian statehood and the two-state solution, and believes these should go hand in hand with the development of peace talks, which should be advanced," the motion said. The vote also saw 111 abstentions. The European Parliament reiterated its support for the two-state solution "on the basis of the 1967 borders, with Jerusalem as the capital of both states, with the secure State of Israel and an independent, democratic, contiguous and viable Palestinian State living side by side in peace and security on the basis of the right of self-determination and full respect of international law." MEPs emphasized the EU's strongest opposition to any acts of terrorism connected with Palestinians' campaign for statehood, however. Several of the EU's 28 member countries were already in favor of full recognition. Sweden in October became the only EU member so far to officially recognize Palestine as an independent state.